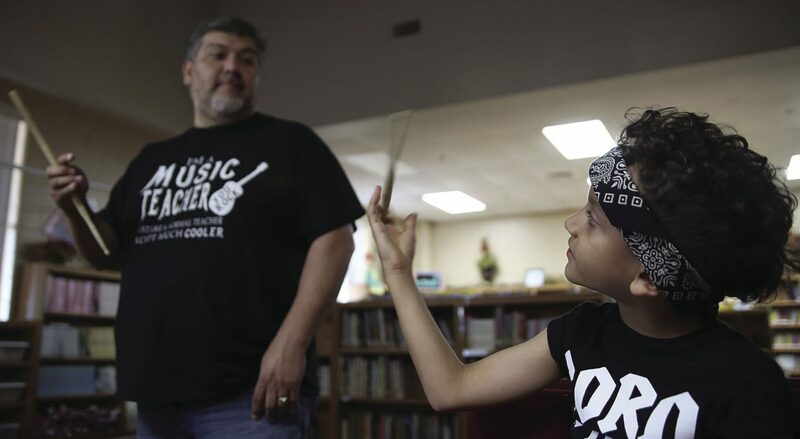 Dr. William Long Elementary music teacher Joe Hernandez, left, shows drummer Sonny Sandoval, 7, how to twirl his drumstick at the school library on May 17, 2018 in Pharr. Lights flash and cycle through changing colors revealing a young band jamming before computers lined against the library wall of Dr. William Long Elementary in Pharr. On a typical day, the room serves as a quiet sanctuary for reading and homework, but the space transformed to a music venue Thursday as second to fifth-grade kids performed rock songs honoring local law enforcement. Officers held their cellphones recording the kids’ three-song performance. This isn’t music teacher Joe Hernandez’s first band. In his 15-year career, this is the third or fourth iteration of the group. Kate Fernandez performs with her classmates on May 17, 2018 at the Dr. William Long Elementary School library in Pharr. 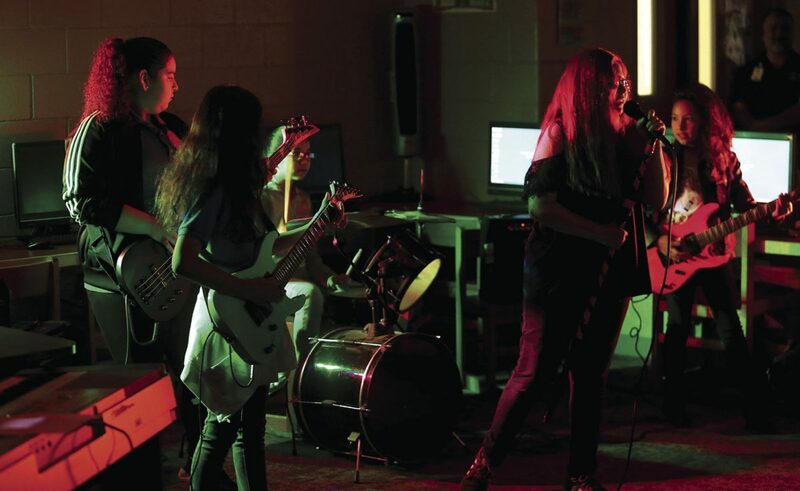 Dr. William Long Elementary School offers a music club that teaches students to play as a rock band, which perform on May 17, 2018 in Pharr. Sophia Acosta, 10, left, and Kate Fernandez perform with their classmates at the Dr. William Long Elementary on May 17, 2018 in Pharr. “I’d always wanted to do it (here), but you need the right kids,” he added. Hernandez said it starts with finding a drummer, which is key to the group and the hardest spot to fill. Last year, during an end-of-the-year “enrichment camp, where we do a week of whatever we want to teach,” Hernandez worked with more than a dozen students on piano, guitar, singing in harmony and drums. Susanna Delgado, 11, stood out. Hernandez started his classical guitar class with about 30 students, and the roster got smaller over the semester. He said the kids just weren’t into it. When the class dropped to about 12, he decided to “reward” the students who were still committed. “‘You guys are the only that stuck around, coming everyday after school, you’re the ones that are going to be in the band,’” he remembers saying. They started by using Hernandez’s personal instruments, which were for adults. Because of guitars’ size they had to play them sitting down. At first, the group was discouraged about how difficult it was learning to play, but Hernandez said he didn’t let them complain. He kept them focused on the task. Bass player Andrea Salazar, 10, said they just sounded like noise at first. But daily meetings started to add up, according to Hernandez. Hernandez credits the success of the program to the supportive administration. 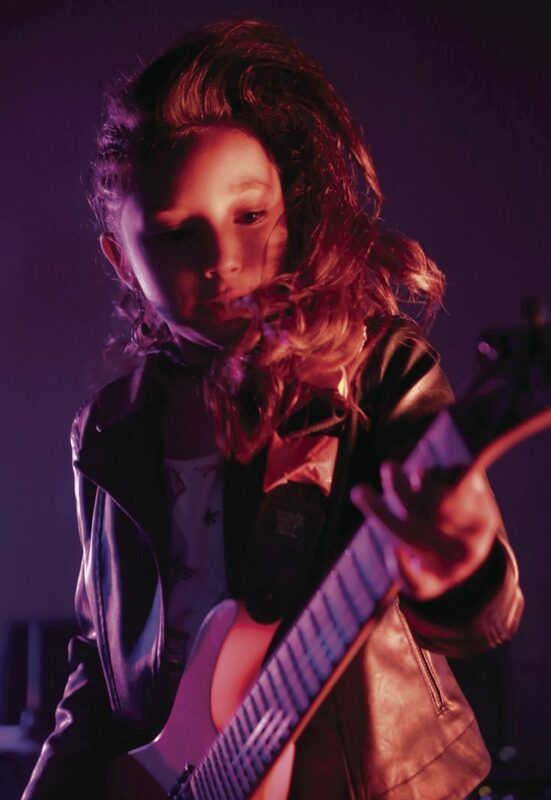 Earlier this year, the school purchased child-sized guitars. Principal Concepcion Ipiña said innovative initiatives like this are a point of pride for the campus. 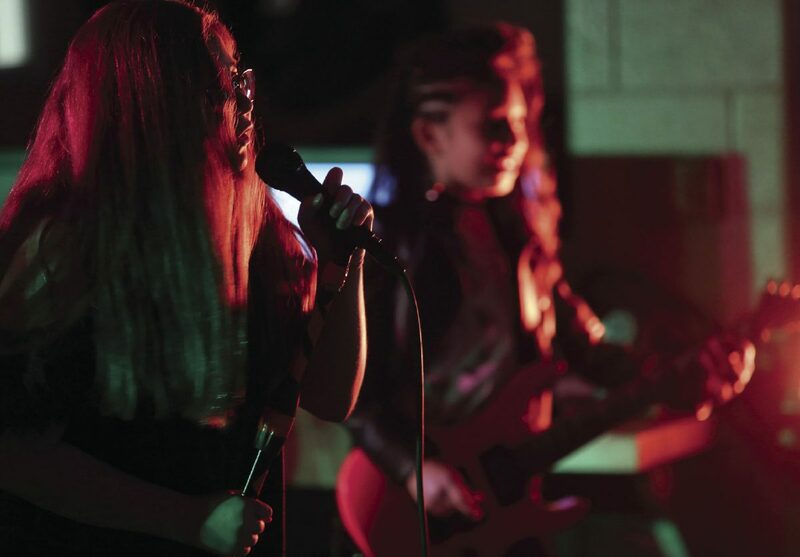 For Ipiña, the rock-music curriculum is “a great way from people to know we have different things going on at this school,” she said, adding that not everyone may prefer choir, orchestra or mariachi. It could help attract or keep students. But for Hernandez, the project is primarily about building self-esteem, responsibility and requiring teamwork. They aren’t successful unless each member is fulfilling their duty and working cohesively. Ipiña said she is currently looking for funding to purchase additional requested items. She always hopes to expand the program, which could include even younger students.